Clyde Vernon McCalman was the son of Mr. R. Odell McCalman and Mrs. Gertrude McCalman. He was born on June 13, 1923. In February of 1945, he was serving as a Private First Class with the United States Army on its final push into Nazi Germany. 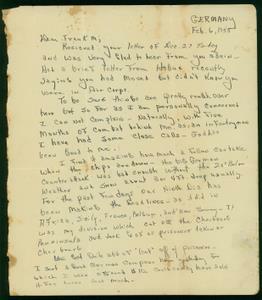 On February 6, 1945, he wrote the following letter to Frank M. Cochran, Jr., who was serving with the United States Army in the Pacific theater. 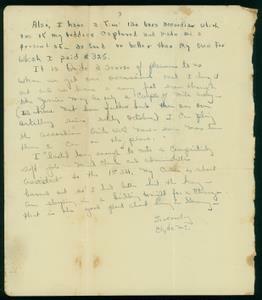 A verbatim transcription of the letter follows the images. Recieved your letter of Dec. 27 today and was very glad to hear from you again. Had a brief letter from Hogue recently saying you had moved but didn’t know you were in Air Corps. To be sure things are pretty rough over here but so far as I am personally concerned I can not complain — naturally, with five months of combat behind me, as an infantryman I have had some close calls — God has been good to me. I find it amazing how much a fellow can take when the chips are down —the big German counterattack was bad enough without the 20 degrees below weather and snow about 3 or 4 ft. deep usually. For the past few days our Ninth Div has been making the headlines — as it did in Africa, Sicily, France, Belgium, and now Germany — It was my division which cut off the Cherbourg Penninsula and took 1/4 of all prisoners taken on Cherbourg. We got quite a bit of “loot” off of prisoners — I sent a good German compass home yesterday for which I was offered $10. Could easily have sold it for twice that much. Also, I have a fine 120 bass accordian which one of my buddies captured and made me a present of — as good or better than my own for which I paid $325. It is quite a source of pleasure to us when we get our occassional rest. I drag it out and we have a song fest even though the Jerries may be only a couple of miles away— (We have not been farther back than our own artillery since early October.) I can play the accordian quite well now — even more tunes than I can on the piano. On March 17, 1945, exactly one year after he enlisted in the U. S. Army, and exactly 39 days after he wrote this letter, Pfc. 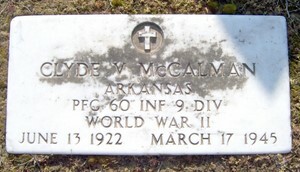 Clyde Vernon McCalman was killed in action in Germany. He was 21 years old.